One of my biggest complaints about the state of the modern automotive industry is that everything always seems to be so damn serious. Everything has to present itself as premium or performance or professional, or some other p-word which is not a synonym for fun. Luckily Jeep’s recent batch of traditional Easter-time concepts is going in a different direction, and this tribute to the 1980s Scrambler Jeep pickup is one of the most fun, and, even better, achievable for actual sale. 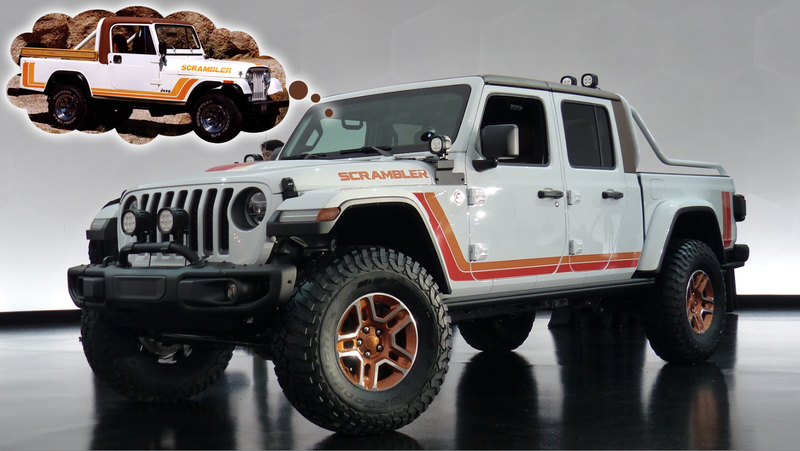 The new Scrambler concept re-creates the old stripe kit, with some subtle modernizations to make the shapes fit more modern design vocabularies, as well as stretching the proportions a bit to accommodate the Gladiator’s longer, four-door cab and shorter bed. The diffused lights to illuminate the bed seem like an especially nice touch, since a truck like this should be able to accommodate doing useful or fun things in the bed with proper illumination. Jeep also raided their accessories catalog and stuck a bunch more lights on the Scrambler, at the base of the A-pillars and on the roll bar, along with a two-inch lift kit, cold-air intake, cat-back exhaust, and those wheels, which have a custom bronze finish. According to our own David Tracy’s notes from Jeep’s presentation, the Scrambler “could be a production vehicle eventually,” and that makes sense, since all we’re really talking about here are stripe decals and some accessories. It’s a fun look for a Jeep pickup, having an air of being capable but also fun, and without that angry-moron trap so many Jeeps fall into when trying to stand out and be different. Bring on the Scramblers, I say. The more nacho-colored stripes in the world, the better. was this name ever a tribute to the old AMC SC/Rambler?